On January 1 2016, ILDA began using the website you are now reading — ilda.com. Our previous website, laserist.org, is still available. It has many files of historical or specialized interest, such as lists of Awards winners or information on old Conferences. We’re also keeping these files since they are already indexed in search engines such as Google and Bing. If you want to go to the old site, click the graphic or this link to access the “secret” home page, www.laserist.org/indexold.htm. You can then use the menus on the left or the “Website-at-a-glance” sitemap at the bottom, to find the page you need. 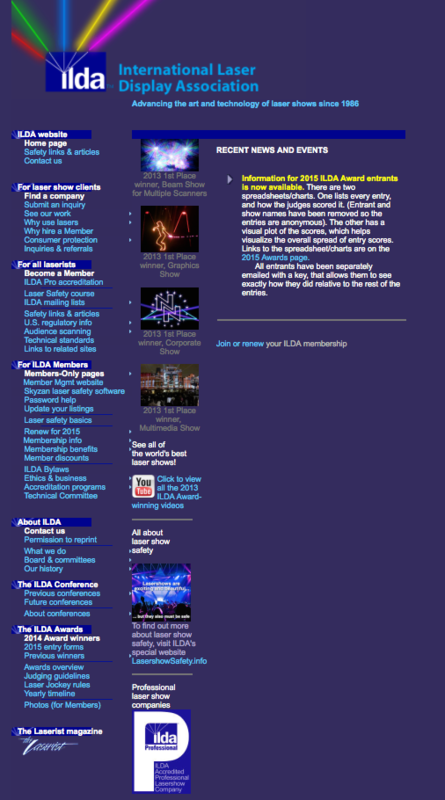 By the way … if you feel that information from the old site should be put here at the new ilda.com site, let us know. Use the “Contact us” link at the bottom of this page to send an email. Include a link or description of the old laserist.org page, and why you’d like to see that information here at ilda.com. Thank you!